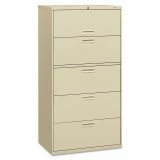 HON 500 Series Five-Drawer Lateral File, Letter/Legal/A4, 36w x 19-1/4d x 67h, Putty - 500 Series lateral files from HON are economical, but substantial. Built to high standards, they offer features not found on files costing a lot more. For example, the fully enclosed, welded base keeps the cabinet tamper-resistant. There are counterweights on two- and four-drawer cabinets to stabilize the center of gravity when a drawer is opened. The counterweights are installed at the factory, saving time and effort. 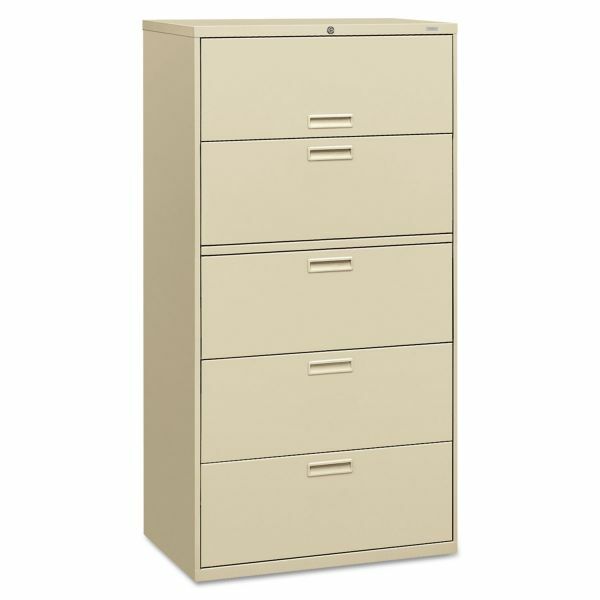 The lock secures both sides of the drawer for added security. The ball-bearing drawer suspensions are made for a lifetime of service. Check out the competition, then choose the best cabinet for the money.